As I promised earlier today, here is the first of many posts about the Dynamic Management Views in SQL Server 2005. Identifies the session associated with each active primary connection. Time when session was established. Host associated with the session. Program associated with the session. Process ID associated with the session. 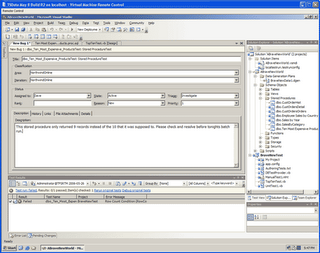 Version of the interface used by the client to connect to the Server. Name of the interface used by the client to connect to the Server. Microsoft Windows security ID associated with the login. SQL Login Name associated with the session. Domain from which session connection was made. Name of the user associated with the session. CONTEXT_INFO value for the session. CPU time, in milliseconds, that was used by this session. Number of 8-KB pages of memory used by this session. Total time, in milliseconds, for which the session (requests within) were scheduled for execution. Time, in milliseconds, since the session was established. ID of the Endpoint associated with the session. Time at which the last request on the session began. This includes the currently executing request. Time of the last completion of a request on the session. Number of reads performed, by requests in this session, during this session. Number of writes performed, by requests in this session, during this session. Number of logical reads that have been performed on the session. 0 if the session is a system session. Otherwise, it is 1. TEXTSIZE setting for the session. LANGUAGE setting for the session. DATEFORMAT setting for the session. DATEFIRST setting for the session. QUOTED_IDENTIFIER setting for the session. ARITHABORT setting for the session. ANSI_NULL_DFLT_ON setting for the session. ANSI_DEFAULTS setting for the session. ANSI_WARNINGS setting for the session. ANSI_PADDING setting for the session. ANSI_NULLS setting for the session. CONCAT_NULL_YIELDS_NULL setting for the session. LOCK_TIMEOUT setting for the session. The value is in milliseconds. DEADLOCK_PRIORITY setting for the session. number of rows returned on the session up to this point. ID of the last error returned on the session. Who cares?? You are not not a real SQL programmer!! You are a "mousey, mousey, click , click" non-programmer. (with a French accent) we spit on you, Video gamer! to be serious, real programmers use a text editor. They know the language they write in. Those stinking "video game tools"slow us down. And they lead us to ask questiosn like this in newsgroups where people liek me will maek fun of you. The review is very positive about the tool and this will be one of those tools that you have to have in your shop, just as is the case with SQL Compare and SQL LiteSpeed right now. SQL Down Under has announced their latest podcast with guest Don Vilen. SQL Server podcast show 17 with Microsoft SQL Server Engine Team Product Manager Don Vilen. In this show, Don discusses the transparent upgrade benefits associated with SQL Server 2005. SELECT FLOOR(@Value * 3) / 3.0,CEILING(@Value * 3) / 3. All you have to do is create a photoshopped depiction of Joe Celko as an action figure. What do you call a blonde who dyes her hair brown? Quest Software, Inc. announced the newest version of its award-winning Toad™ database management product family. Toad for SQL Server 2.0 includes new features such as one-of-a-kind integrated debugging, SQL optimization, and integrated comparison and synchronization capabilities for SQL Server 2005. These new features further improve the productivity of SQL Server developers and database administrators (DBAs). SQL Optimization - Automates the process of identifying problematic SQL then re-writing and benchmarking it for optimal SQL Server performance. Compare and Sync – Provides advanced integrated comparison and synchronization of schema, data and server settings of two SQL Server environments. Debugging – Offers integrated debugging capabilities for SQL Server 2005. From the site: "At the heart of most web sites once you dig down below the routers, below the web servers, below the ASP.NET code you find a critical piece. The heart of the matter if you will is the database and if that heart stops... well let’s just say your website will assume room temperature quickly. The question is; what do the guys at Microsoft.com do to insure that the heart of the system is thumpin’ and pumpin’ day in and day out 24x7 while still needing to do updates, patches, server maintenance etc.? Well never fear because we have the answer for you so listen up and learn something!" To provide a set of useful extensions to Analysis Services 2005. To provide a variety of example source code for people looking to write their own stored procedures. In mathematics, the Sieve of Eratosthenes is a simple, ancient algorithm for finding all prime numbers up to a specified integer. It was created by Eratosthenes, an ancient Greek mathematician. Wheel factorization is often applied on the list of integers to be checked for primality, before Sieve of Eratosthenes is used, to increase the speed. Strike off 2 and all multiples of 2 from List A. The first remaining number in the list is a prime number. Write this number into List B. Strike off this number and all multiples of this number from List A. The crossing-off of multiples can be started at the square of the number, as lower multiples have already been crossed out in previous steps. Repeat steps 4 through 6 until no more numbers are left in List A. Quest has a nice little give away. They are giving away 40 2GB Apple Nano iPods to people who are willing to try LiteSpeed for SQL Server. Tim O’Reilly has posted his latest State of the Computer Book Market article. Here are 2 excerpts: “Looking at the Database rollup, we again see the strength of SQL Server, the decline of Oracle book sales, and that while MySQL is still a much larger category than Postgres, Postgres is showing some curious strength. This is one of the things that treemap visualizations are good for. Small, bright green categories stand out, and you can start paying closer attention. (Ruby also showed bright green while it was still a tiny category before its remarkable surge over the past year.) We also see the continuing popularity of personal databases like Access and Filemaker. • C# book sales continues to gain on Java, with a 49% unit sales increase compared to Java's 10% decrease. • Ruby continues its momentum, and is the fastest-growing programming language in terms of book sales. • Microsoft's new release of SQL Server has continued to drive significant book sales, with that market up 86%. ASP.Net is also on a roll, with book sales up 61%. Column names in each table must be unique. Column name 'SPID' in table '#TempSpWho2' is specified more than once. Now why doesn't @@IDENTITY return 5 but 1?